I love how feminine all of the ruffles are in this outfit. The outrageousness of the top is balances out by the simpler bottom. I don't know why, but I am super obsessed with the idea of wearing bloomers. I would love a pair to try and throw into the mix. Safari jackets are becoming very popular, but I think that they are very outdated. 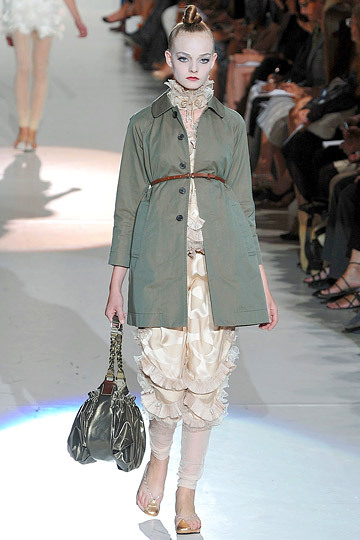 I do love the boxiness of the jacket with the billowing ruffle mess of the piece underneath, however. I would die to have a dress/skirt with that sort of silhoutte at the bottom.